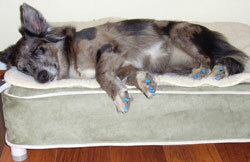 We just want to say that we love Soft Paws and wanted to send a picture of our dog snoozing in style! 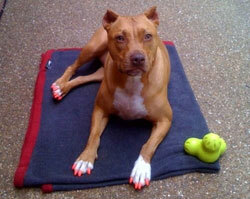 I received my nail tips today for my puppy Aadison and was amazed at how easy they were to apply! Aadi has not chewed at them once and they really work! Being a puppy, she doesn't understand yet how badly she hurts when she scratches at your leg. The tips have definitely been a leg saver! 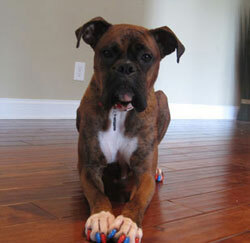 We recently ordered Soft Paws for our boxer Roger to prevent him from scratching our hardwood floors. We've gone though 3 pairs of dog booties and his nails were still scratching the wood. I did some research online and discovered Soft Paws. Roger can now play on the hardwoods worry free! The Soft Paws were super easy to put on his nails and he doesn't even notice he has them on! We decided to get two colors for his nails to keep him colorful and patriotic for the summer! floors, the furniture, or us! Not to mention, they are adorable! People ask about them all the time. 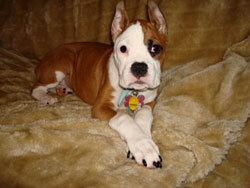 I would recommend these to any and all pet parents! Thanks again, guys and I am so grateful for your awesome product! 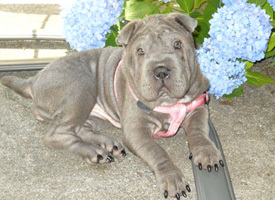 Our 7 month old Shar Pei, named Bailey has been wearing Soft Paws since we got her (7 weeks old). We love them! They are great! We have told many of our friends about your product, as well as people who see her and wonder what she has on her nails! We recommend Soft Paws to everyone.